In the Clearwater Wilderness, at 5,400 feet high, lies a pristine, calm, and dark blue alpine lake. 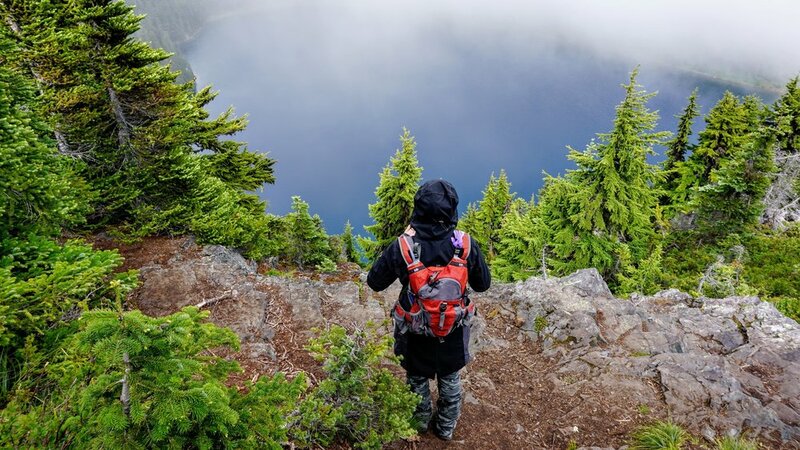 Reaching this magical area in the early summer months will have you hiking your way through forest, switchbacks, and trail junctions, as well as passing other lakes, fields of avalanche and glacier lilies, and if you're lucky, wildlife. During our visit we were accompanied by clouds hanging right around the treeline. However, we've seen photos of a nearly-cloudless day there and the views are amazing. Nevertheless, our trip was a great one and the clouds that day simply give us another excuse to revisit soon. We set out on Summit Lake Trail #1177 around 2:30 P.M. on a Monday. The lot at the trailhead was pretty packed due to this being 4th of July and all. The clouds were off and on the entire drive up. We were hoping for clear skies, but in Washington you get what you get. The trail began with us mildly ascending for roughly the first mile. The trail was rocky and interwoven with tree roots for this first portion. Periodically there were logs in place to fortify our footing or along the sides to maintain the trail and also as stairs. Soon a log footbridge could be seen ahead with the rush of a small waterfall off to our right. There are a few of these bridges along the way. We reached a junction that had a small lake straight ahead with a trail leading right to Bearhead Mountain and the trail left to Summit Lake. We continued left over another small bridge. From this point we could see obvious signs of prior back country camp sites adjacent to the trail. While there were many vehicles parked when we arrived, we didn't see any campers until we were on our way down. The trail continued on, soon turning to a series of long switchbacks. There are a number of side trails that tried to tempt us away from our intended destination, but we stuck to the trail until we made it to the lake. Along the way there was a plethora of wildflower blossoms. As we got closer to the lake the forest opened into a meadow, we were greeted with beautiful tracts of avalanche lilies. Being the 4th of July it was easy to draw a comparison of the these white, star shaped flowers to the stars on the American flag. The deep blue that is Summit Lake only made this comparison more complete. We were immediately cloaked in cloud as we reached lake side. The wind was our constant companion throughout the hike and it now seemed to want to keep the lake as its own secret jewel. Accepting that photo opportunities would be of the mist shrouded variety, we followed along the trail to the left, skirting the lake to our right. Ahead was a small ridge with another smaller lake off to our left. We ascended to this upper viewpoint and poked around on the various trails. There were numerous campsites among the trees here with plenty of flat space perfect for tents. The clouds and mist blew in and out, taunting us with peek-a-boo views of the sapphire we had come all this way to see. Following the ridgeline up and around the lake, we were finally rewarded with some spectacular views. The trail along the ridge, well above the lake has many off shoots. There are some really excellent viewpoints from up here. The deep ultramarine of the lake is so striking. Between drifts of clouds, distant, still snowy mountains and valleys with towns were visible, depending on which direction we were looking. We explored up here for some time and did get a little off track, but quickly corrected and made our way back to the main trail. While the lakeside is absolutely worthy of your time, the best all around views are definitely from the ridge above. While the clouds prevented us from seeing too far into the distance, we were granted the approval to get some excellent shots of Lake Summit and the meadows below. The way the clouds covered the lake was reminiscent of the way a mother hen guards her chicks, she'll grant you partial, quick views of her prized ones, but only momentarily. Again the fog and clouds were intermittent and interspersed with stretches of rain. The trail back down to the lake crossed some meadows and there was evidence of rock slides from the higher walls of the cliffs. We were socked in with fog again as we made our way back down, it was misty but not rainy. There were yet more campsites available here and even a vault toilet (the out in the open kind with only a half wall on one side). Our trip back was uneventful and mostly solitary as we had started in the afternoon and most of the others were long gone by now. We did hear the occasional pop pop pop of either gunfire or fireworks, but those sounds were distant and infrequent. There are a number of areas that are obviously used for target practice just along the roadside. There were plenty of birds flitting and singing throughout our trek and so many wildflowers. We didn't see any other wildlife, but have read that deer, elk and even bear frequent the meadows. The drive to the trailhead is half the journey. Once you've reached the one way bridge crossing the Carbon River you're in for a rocky, bumpy, long 6 mile drive up an old logging road. There are large potholes, ruts, and rocks in the path. With that being said, there were more than a handful of standard cars parked at the top when we got there. We also saw one very low clearance vehicle making its way down around the half way point. Take your time and you'll be able to make it. Get yourself to the Carbon River Ranger Station and then use this map for the rest of the driving directions. It also includes some points of interest and our GPS tracks. If you're curious, the app we used for the GPS tracks was AlpineQuest GPS Hiking for Android. This was our first time using it, and it does seem a bit pricey, but the maps available with it are fantastic. Our tracks appear to be pretty much on point as well. This is a great hike! Even on the damp, foggy, cloudy day we were there, it was a great hike. This one isn't terribly difficult, it's relatively short, the trail is well delineated and there is plenty to see. On a clear day, the views are sure to be awe inspiring from atop the ridge above Lake Summit. We will return and likely camp here, as it was simply lovely!